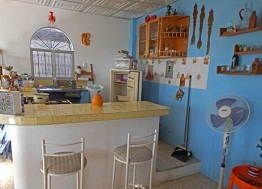 Today, we’re going to look at what you can buy on a $50,000 real estate budget in Latin America. That’s a pretty tight budget. But it goes a long way in some locations. In fact, it will buy an ocean-view condo or a villa only four blocks from the beach. Read on to find out just what you can get for $50,000 – or less. Pick #1. Southern Zone, Costa Rica. Lot: $40,000. 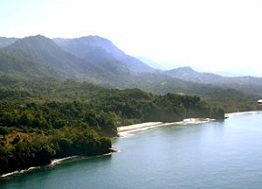 This area is home to stunning landscapes: sharp mountains, thick forest and unspoiled beaches. It’s packed with exotic wildlife. It stayed off the beaten track because it was so tough to get here. But a new coastal highway is slowly opening up this eco-wonderland to tourists and second-home buyers. In the gold standard community in this location, you can buy a lot for as little as $40,000. With no build requirement, you can sit on your lot and wait for values to rise – or build your custom dream home. Pick #2. Rocha, Uruguay. Lot: $27,965. This coast looks like the Hamptons – before super-rich tycoons and bankers moved in to build their summer palaces. 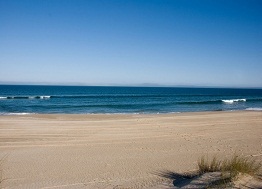 The deep-blue ocean fringes miles of wide sandy beaches, backed by huge dunes. Nature reserves and lagoons and little beach towns dot this coast. Big developers already have an eye on this place for its future potential. And so should you. Right now, real estate prices are a fraction of what you’d pay in better-known seashore locations in Uruguay. A half-acre lot in a small community close to the beach costs just $27,965 until September 1, thanks to a 15% discount from the developer. Pick #3. 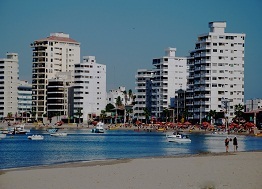 Salinas, Ecuador. Condo: $47,500. This one-bed 750-square-foot condo is great value for money. It’s in a central location in Salinas, a buzzing resort city on Ecuador’s southern Pacific coast. It’s close to the boardwalk, beach, shopping, restaurants and cafes. And the condo’s even got an ocean view. Property taxes run around $100 a year, and the monthly condo fee is $50. Pick #4. Ballenita, Ecuador. Villa: $45,000. Ten minutes north of Salinas is the upcoming expat town of Ballenita. And here you’ll find a 1,600-square-foot villa with three bedrooms and two bathrooms. The house is only four blocks from the beach. It needs some updating. But at $45,000, there’s plenty of wiggle room to turn this villa into a stylish beach hideaway. Pick #5. Arenal, Costa Rica. Lot: $17,500. Arenal is a gorgeous spot, a mix of lakes, volcanoes, forests, farms and little towns. It’s rural charm at its best, where you can drive on quiet country roads…boat or fish or kayak on the lake…and shoot the breeze with friends over good food and a glass of wine. Despite its many attractions, Arenal is undervalued. That’s why you can pick up a lake-view lot, with utilities close by, for only $17,500. Better yet, the owner is willing to negotiate. Pick #6. 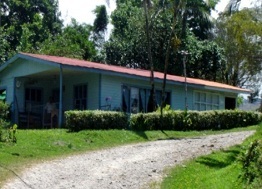 Arenal, Costa Rica House $42,500. 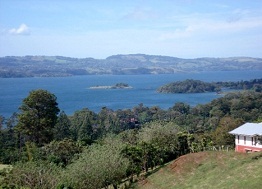 Also in Arenal, a house with a lake view. It needs updating but $42,500 is a great price for a home in this location. So, six picks that prove you don’t need a mega-budget to purchase an overseas property. Properties at this price level are getting harder to find these days. If you’re on a limited budget and want to snap up one of these bargains, contact the brokers and developers today to get a full information package. Margaret Summerfield should be credited for much of the research and leg work on finding you these great affordable international real estate investment deals.